LONDON--(BUSINESS WIRE)--According to the research report by Technavio on the global IIoT market in the automotive industry, the market is expected to accelerate at a CAGR of more than 33% during the forecast period. The decreasing cost of sensors is one of the key drivers for the IIoT market. 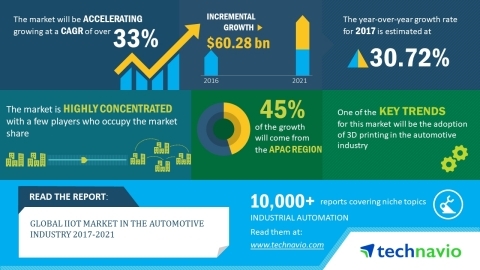 According to the report by Technavio on the global IIoT market in automotive industry, the market is set to post a CAGR of over 33% until 2021.